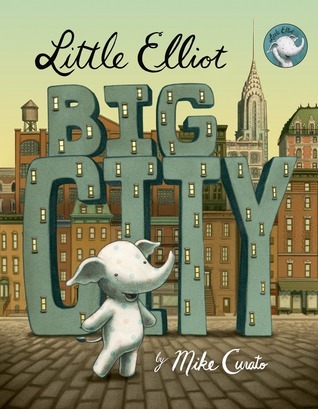 Little Elliot was an elephant who was different from everybody else. He lived in a big city, where he had to be careful because he was so little. The one thing Elliot wanted more than anything, was a cupcake. But he was too small to reach over the top of the counter and so he was never even noticed. Then one day, Elliot found someone who was even smaller than he was, a mouse. And the mouse had even bigger problems than Elliot because of his size. Elliot was able to help the mouse by lifting him up. And the mouse was able to help Elliot when he was lifted up over the top of the counter at the bakery. Now Elliot finally got a cupcake… and something even better, a friend. Mike Curato first picture book is treat for the eye and ear. His artwork has the perfect balance between vintage and modern. And his story has mass appeal for children and adults alike. Little Elliot’s sweet innocence and sweet tooth will capture your heart. It has mine!